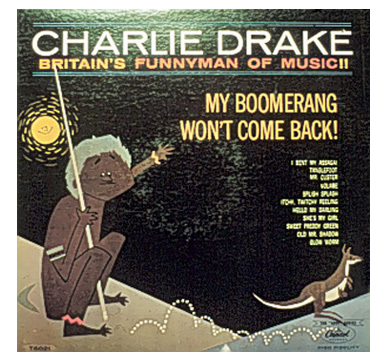 My Boomerang Won't Come Back, the 54-year-old novelty song by comedian Charlie Drake, has been banned by Australia's national broadcaster for being offensive. The track, about an Aboriginal boy banished from his tribe because he can't use the traditional weapon, topped the charts down under in 1962. However, when it was played on ABC's radio station in Hobart, Tasmania, in September one listener complained that it was racist. They added: 'The song was not on a regular ABC playlist but was aired because it was requested by a listener. This error was due to staff not being familiar with the track's lyrics. Drake's song – which was produced by George Martin before he went on to work with The Beatles – was controversial even at the time of its 1961 release. The BBC refused to play the original version which contained the line: 'I've waved the thing all over the place/practiced till I was black in the face', so it was re-recorded as 'blue in the face'. The lyrics have Drake's character – who maintains his Cockney voice – going to a witch doctor to learn how to throw the boomerang,and charging him 14 chickens. Its lack of political correctness also means an Aboriginal meeting is described as a 'pow-wow', a term usually associated with Native Americans, while the chanting on the track sounds more African than Aboriginal. The song reached No 14 in the UK, No 1 in Australia and No 2 in Canada. It prompted Drake – who died in 2006, at the age of 81 – to follow it up with I Bent My Assegai, about the Zulu spear.